As the boats finish their second week at sea on their passage of nearly 3000 nautical miles, here is a selection from their blogs of their experiences so far after leaving the Galapagos on March 10. This is called the “coconut milk run” because once you arrive, everyone travels to all the islands where the coconuts are plentiful. I’ve been struggling with seasickness for the past three days but have finally turned a corner. As we make this transit, I ponder the offer Pat made me before leaving on this journey. Several wives and girlfriends flew home to take care of personal business and/or a break from the boat and he offered to do the same. I never hesitated for a minute to say “no” because I wanted to share in the memories of this long transit. I’m sharing in a dream of my husband that may only happen once, plus learning all you ever wanted to know about a boat. On the up side, I have been promoted to “admiral” and am wearing the title proudly. This whole BPO adventure has made me a better person and I wouldn’t change a minute of it…except maybe add more chocolate! Seriously. 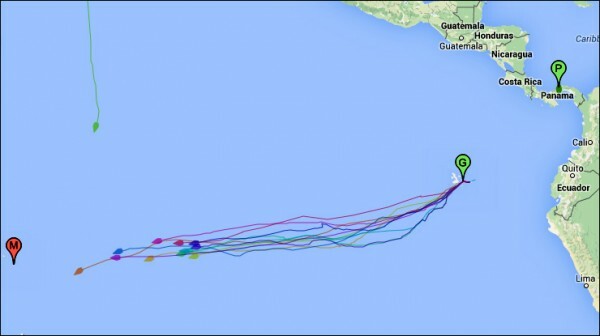 “They” said… when you leave the Galapagos you will immediately be in the glorious 10-15 knots trades. You will set your sails once and cruise downwind all the way to the Marquesas. Ha! We are in some weird vortex that we apparently missed knowing about in all of our research. This phenomena frequents the area between 3-5 degrees S and 90-108 degrees W and is known for no wind, rain, lightening. I’m actually afraid to calculate our ETA and instead trying to get through chunks of time, like the morning, then the afternoon, then the evening, etc. The captain is faring better than I knowing full well that sailing is a good test of one’s patience, and since he’s been tested more than me he’s a lot better at it. We left San Diego on Tuesday, March 10th, with fuel, propane and water topped off and enough food to get us to Australia in the fall if we manage it well. With 2838 miles to go before our next port in the Marquesas in French Polynesia, we needed to each develop a circadian rhythm that would give us enough rest and some rejuvenation and have one of us on deck 24/7. Our new rhythm: six hours on watch, six hours off, over and over and over. Our rhythm started feeling more natural as the second night gave each of us almost five hours of sleep and the following night, almost six, plus a little napping for both of us during the day. On day three, we turned on the hot water heater for 30 minutes, about the max we could afford in electricity, as we must produce everything we use. The refrigerator and the auto pilot take huge amounts and most boats resort to turning on the engine or bringing a gas generator, but with wind, solar, and a water generator, we haven’t had the engine on since we pulled out of San Diego harbor. In Jerry’s night shift he saw the reflection of the lights of a big ship in the clouds of the horizon. It’s the closest we’ve come to seeing anyone since a ship passed us on the 11th. Otherwise, there has been no sign of human life: no planes or boats of any kind for the past four days. My sleep time starts at 8pm and I can’t wait to get into bed. I know it won’t be long enough. My night watch starts at two am when Jerry wakes me. I feel groggy and not ready for prime time. Once on deck, I lock myself in with a tether to a fitting on the cockpit and my mood immediately rises. The stars are beautiful, the moon is just ready to break the horizon, the breeze is soft, and the night is welcoming. I woke to hear the engine on (again) and the rain (still) falling and, therefore, took an extra long time to crawl out of my berth. Once I did, I was greeted by the biggest hug and energetic announcement of our plans for the day. During the captain’s night watch, Terry decided that all rainy days on land or the sea should include movies and comfort food so today was to be “movie day”. The truth is, for the past 3 days we have just been sitting…and staring…and waiting for sun and wind. No wonder I was in a funk! However, before I could finish brewing my coffee for movie #1, Terry called me up on deck to see something we hadn’t seen in a while. A clearing! Yes. Real bright blue skies and big puffy clouds just ahead. Terry pulled out his ipod and found the perfect song; “I can see clearly now the rain has gone…I can see all obstacles in my way”! We cranked it up and we blasted it on VHF channel 72 for our sail mates on Ransom. It was an instant mood and morale lifter for us all. Before we finished drinking a single cup of coffee the winds came. GET THE SAILS OUT! ALL OF THEM! ANY OF THEM! WE CAN SAIL!! So we pulled out both of our light air sails and they were so happy! We turned the engine off, headed directly for the clearing, and finished our now cool coffee. The wind stayed a little hit or miss but we chased it and kept it all day. At dusk, we were treated to the most brilliant rainbow either of us have ever seen and then a spectacular sunset. Terry remarked that only 5 people in the world (us and Ransom) were likely seeing that rainbow. Crew is settling in nicely. Ransom’s systems still throwing us enough challenges to keep the brain, hands and tools engaged. Recent events include a mini flood of forward head caused by broken grey water pump, masterfully replaced by Pip. Good thing we had a spare on board, another one coming. We have been sailing in the company of our friends on board Libby, an Amel 53 ketch. It’s nice to have someone else to share the day’s events with. For the past six days, they have been within six miles of us but it now looks as they are pulling way ahead of us and changing course getting ready to deploy their Argo weather buoys for NOAA. We don’t spend too much time calculating or thinking about the distance and time to the Marquesas, it is a long way to go. What’s the big deal? 24, 28, 32 days at sea. How hard can it be? Sunshine. Tropical waters. Beautiful sunrises and sets. Moon cycles. Wildlife. No conference calls. When was the last time you sat in the rain for 4 days and 4 nights in a row? You didn’t go inside and take a hot bath. You didn’t go to the basement and watch a movie. You just sat outside for 4 days of rain. When was the last time you ate like this: nothing but fresh food for a week, then only frozen or canned goods for two more weeks? When was the last time you spent 24 solid hours with 1 other person? No alone time, no change of scenery, no new opinions, just you and 1 other person. When was the last time you had to do everything with only 1 hand (I have a few 1 armed friends who don’t get to answer this one ;). You only get to use one hand because the other one is always, with every step, hanging onto something so you don’t fall over. Think about doing everything you do while standing on a swing. That’s how it feels most times. When was the last time you had to decide which was more important; making toast, charging your laptop, or listening to the radio because you only have a finite amount of electrical power and you can only choose one? When was the last time you did laundry in a bucket and had to hang it for 3 days to dry because intermittent rain showers you never saw coming kept rinsing it ‘again’ for you? When was the last time you had to pick dead squid off your front porch every morning? When was the last time you had to do mission critical things in total darkness in the middle of the night when all you want to do is sleep? When was the last time you settled down to write a blog but the weather started to shift and you had to focus 100% on not back winding the boat? Heck, when’s the last time you had to know what back winding was?? Because when was the last time dolphins slept under YOUR bed? We had assumed that the trades would be like coming off a bumpy back road on to the autobahn. No one told us that there would be a lengthy transition on a highway with various sections of potholes and that a few detours would pop up as they have now. To wit, we’re actually sailing north due to a wind shift to the south. On my round trip to the galley and a coffee top up, I notice that a now non-flying flying fish had somehow made its way through the eight inch by twelve inch port opening and onto the shelf above the sink. Yesterday Bill found one in the port head. Every morning our deck reconnaissance reveals at least another half dozen. And, while our angling skills are down right embarrassing (lost another chunk of tackle yesterday), we’re constantly delighted by those flyers who skim like virtual Tinker Bells throughout the day in torrents across our bow. It is liberating to be standing on the fly bridge of our catamaran at midnight with the wind whipping through my hair with no other boats in sight and stars as far as the eye can see. It is definitely a rush when you’re just a tiny speck in this huge ocean. I know that I’ve said that we’ve questioned a few times whether this adventure was a great idea but there is no doubt in my mind that we’ve done the right thing. The amount of knowledge that I’ve learned regarding the state of the ocean, the boat, sailing, etc. has been stimulating to say the least. One observation that I can make is the Pacific ocean is still a pristine ocean with no obvious signs of trash floating anywhere. It was sad and frustrating to see the amount of trash floating between Florida, Jamaica, San Blas islands and on to Panama. Since we’ve exited the canal on the Pacific side, we’ve seen less than five things floating in the water and we’ve traveled more than 2000 miles with thousands more to go. It’s not a race, we are frequently reminded, and we remind ourselves. But in fact, for us, it is two races. The most important one is to make the best possible crossing given whatever conditions we encounter. In this race I think we are doing very well. The winds have been unusual/challenging. But we have kept the boat moving nicely, taking advantage of whatever is available. Our second race is against the other boats. For starters we want to prove (to ourselves) we are faster under sail than the other catamarans. This is pretty much accomplished already, as they are 60+ miles behind us. But there are two boats ahead of us. Blue Wind is reputed to be a serious racing boat, though I know nothing more about this than seeing how fast they go! Tahawus is a fast cruiser, but is 54 feet long to our 42. We’d like to prove (to ourselves) that we can go faster than they can, in certain conditions. So far we have not found those conditions. We have been going fast, but they have been going equally fast, or slightly faster. I think there are conditions (fairly high wind, downwind, where we might be surfing at 13 knots or more) where we could overtake them, but we haven’t had such winds, and I’m not sure if we will on this crossing. The wind finally picked up for us and we had two good days of sailing with speeds up to 8.2 knots. We began to believe that our strategy of motoring south during the light wind days to reach the southeast trade winds around 7 degrees south latitude had paid off. Wrong! The third day and night we had no wind above 6 knots. Yesterday we motored for three hours to try to find some wind however that proved fruitless, and we resigned ourselves to drifting with the current – just over 1 knot. While doing that Bob cleaned some early stage barnacles off the hull of our boat (tethered to the boat of course) and Carol did some minor sail repairs. While we are in no danger of starving, Carol has starting budgeting our remaining food supplies to ensure we arrive before the food runs out! For the past two nights we have been sailing in the company of two other sailboats, Lovesail from our rally and the other being a Norwegian boat with a young couple (25 years old) aboard. It’s been nice to see their lights at night, and their sails during the day, as well as to talk to them. While all boats on this track are heading to the same destination, it is remarkable that after sailing twelve hundred miles we would end up within a few miles of each other. There are a number of rally boats within fifty miles of us, but there are four that are well ahead, two at least a day ahead of us, and two at least two days ahead. They sailed west while we headed south for the first few days! We did the same thing on our trip to the Galapagos following conventional wisdom and weather reporting and with similar results. Next trip we might just follow them! Yesterday arrived with the realization that we are one day away from the half way point on our 3000 mile journey to Marquesas. Of course, it also brought flat, calm seas so smooth you could water ski going at least 50 miles an hour. While it is beautiful, it is not what you desire when trying to sail a sailboat to conserve fuel. With trepidation, we turned on our engines and proceeded to motor throughout the day. The crew started thinking of creative ways to pass the time. We were given a huge bunch of green bananas before we left Galapagos. They are all ripening at once, so today, I baked chocolate chip banana bread which is a huge favorite on the boat. Tomorrow it will be chocolate banana pudding and then maybe a banana cream pie. Since it was such a flat day at sea, we decided to wash our sheets and hang them to dry in the sunshine. By the time we got this chore done, we were roasting so we decided to stop the boat and go for a swim. I’m always game for a swim anywhere, anytime and I’m usually the one to go first. It is 10,000 feet deep but very clear azure blue water. Even though the engines are off, you are drifting with the current at 1-1/2 knots which means you have to throw a line off the back of the boat to hold onto or we would be practicing a man overboard maneuver on someone. John and I jumped off the side of the boat. The water was a warm 83 degrees and felt refreshing and we really didn’t want to get back on the boat but we could see jelly fish in the water and quickly climbed back up the ladder. Sue who is always on shark watch decided she would go for a dip as well. So of course, I decided to jump with her because I couldn’t resist the opportunity to go back into the water. What a fun way to break up the afternoon! In the midst of keeping ourselves on track and marveling at how Pacific this ocean can be. Truly! Like the proverbial mill pond … horizon to horizon like glass. Eerie. Until, the East Pacific Aquabatics Team arrived of a sudden from out of this strange liquid plateau. Didn’t count them, but at least twenty dolphins arrived to light up our somewhat under energized day with an exhibition of water ballet like you’ve never seen. There were pairs of either youngsters or otherwise intimates concocting the most intricate and precise maneuvers in every direction, side by side and, in a move in which they’ve obviously been well coached they performed the whirligig: in complete and perfect tandem the pairs would revolve around one another looking like a duel blade propeller. This treat went on for a good fifteen minutes … and then they were gone. For whatever reason, Scorpio dominates the skyscape, maybe because it is so geometrically unique among the other constellations. Maybe it is there to give hints of the treacherous magic of these times – how, if one carefully and tenderly negotiates the potential sting and toxicity of humanity’s tail, the possibility of the living mystery of peace and love can be divined. Sorry. I may have traded my sanity for this lapse into floundering in a sea of wonderment. I don’t have Google to provide the answers. What a novel situation! Finally we seem to have the expected trade winds. For the past 24 hours they’ve been blowing 13 knots. We’re happy to be sailing once again. We have just the spinnaker up, which makes for very easy going. Just set it and forget it, so to speak.